With all the new tooth-colored fillings for cavities, it's easy to overlook metal amalgam. While this mainstay of dental care for over a century might not be as attractive as composite resins or glass and resin ionomers, it still has the advantage of strength and durability. Amalgam is a stable metal alloy usually made up of silver, tin, copper and mercury. The metals are proportioned and mixed precisely to guard against “free” mercury molecules, which could pose a health hazard. The mixture is pliable at first, but then sets hard once molded into the prepared area of the tooth. Besides strength, amalgam's other advantages include low cost, high resistance to wear and biocompatibility (not toxic to the body or allergy-producing). At the same time, it can require more tooth structure removal to accommodate a filling and cause higher sensitivity to temperature for a while after installation. Its main disadvantage, however, is appearance — it's now considered unacceptable from an aesthetic point of view to use it in visible areas like the front teeth. Because of this, materials resembling natural tooth color are coming into vogue, especially as their strength improves. Still, dental amalgam continues to play a useful role, especially in less visible back teeth with higher chewing forces. One past concern about dental amalgam is the inclusion of mercury in the alloy. As mentioned before, mercury is hazardous in a “free” form when not knit microscopically with other metals; as such it can emit a vapor that could enter the bloodstream and damage the nervous system. But after several studies by various organizations, the American Dental Association has concluded amalgam's precise mixture prevents the mercury from taking this form: although some vapor is given off during chewing it's far too low in concentration to pose any danger. 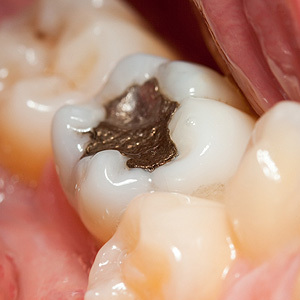 Dental amalgam continues to be an effective choice for fillings. Whether it's the right choice for you will depend on the type and location of a tooth to be filled, and whether durability is a higher concern than appearance. If we do recommend an amalgam filling, you can be assured it's a safe and lasting choice.